Alinsky Saul D Allen Michael Baird Norman Barnett Hilaire Beatson J Begley Sharon Bhaha Homi K Branston Gill Brooke Heather Bull Hedley Cannon John Caplan Pat Craig P P Craig Paul Denning Lord Foster Nigel Garner Bryan A Gray John Harris David Hayward Anthony Hitt Michael A Hutchinson John Lederach John Paul Locke John Lodge Juliet Luttwak Edward N Machiavelli Niccolo Martin Tony Marx Karl Mckendrick Ewan Mill John Stuart Paine Thomas Poole Jill Robert Collins Roberts Sir Ivor Smith Clive Stafford Smith Adam Strange Carol Anne Sutcliff Michael R Sweet & Maxwell Sweet & Maxwell Thomson Templeman Lord Thoreau Henry David Wade H W R Wallace Irving Washington Harrirt A English Jack Cotran Eugene Symes Mark Macdonald Ian A Stone Richard Hungerford-Welch Peter Bingham Tom Hardy Christine Bloon Allan Carner Bryan A Hoffan David Chuah Jason C T Steiner Josephine Steiner Henry J Berridge G R Eriksen Thomas Hylland Kissinger, Henry Chez Winakabs Savage Joel Sharp Gene Achebe Chinua Mansfield Michael Anderson James Berkman Alexander Herbert Nick Evans Suzanne Ernest Satow Lord Gore-Booths Sir Ivor Roberts Kissinger, Henry More..
A classic novella about the fallacy of the American dream, THE PEARL is Steinbeck's flawless parable about wealth and the evil it can bring. When Kino, an Indian pearl-diver, finds 'the Pearl of the world' he believes that his life will be magically transformed. He will marry Juana in church and their little boy, Coyotito, will be able to attend school. 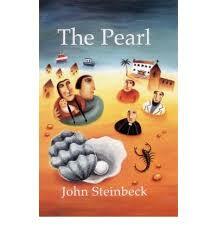 Obsessed by his dreams, Kino is blind to the greed, fear and even violence the pearl arouses in him and his neighbours. Written with haunting and lyrical simplicity, THE PEARL sets the values of the civilized world against those of the primitive and finds them tragically inadequate.